Meet Nathan Jacobsen – from giving up on endurance events to cycling 600km! 25 Jul Meet Nathan Jacobsen – from giving up on endurance events to cycling 600km! 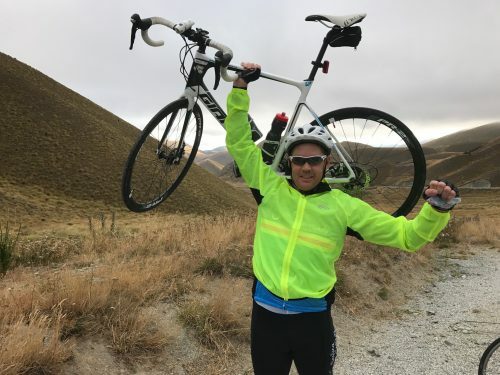 Meet Nathan Jacobsen (yes, he does know he has to sit on the bike rather than overhead press the bike… he’s just excited about his recent achievement!) He joined us back in May 2016 because of the strong technical focus that we have when it comes to training people for life’s adventures. When Nathan first started he had a number of recurring injuries (left shoulder and foot, right knee, neck and lower back). Now, he is experiencing virtually no symptoms, which he says is a wonderful feeling and one that has clearly left him feeling like he can take on anything! Due to his previous injuries, Nathan had given up on the endurance events that he loved so much during his 30s. “Joe’s Basecamp has proven that I can do these again, and I feel revitalised and strong” he says. It just goes to show that a lot of determination and positive thinking can go a long way! Age and ability are no barrier, and that’s exactly what we keep telling the people who walk through our doors. Adventure isn’t just about ‘living while you’re young’. It’s about living at any age – pushing the boundaries of what you think you are mentally and physically capable of. We think Nathan is a perfect example of this, having gone from believing he could never take part in endurance events again to cycling 600km!